Deliciously shimmery with even more sparkle... meet BLINGZ! As if it were possible to make something even more sparkly than Shimmerz, right? 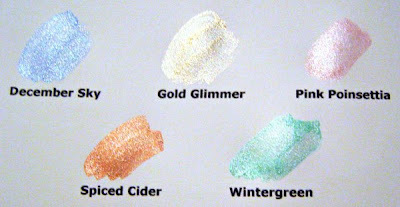 Here are our five Blingz colors: December Sky, Gold Glimmer, Pink Poinsettia, Spiced Cider, and Wintergreen. They're gorgeous, non-traditional colors for the holidays. This release is planned as limited edition, so jump on the opportunity purchase them while they're available. Who knows? If everyone falls in love, they may be here to stay! 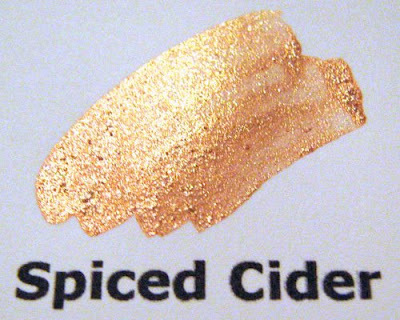 Here's a closeup of the Spiced Cider color so you can see the extra sparkles in it. It's such a pretty bronzy-copper. *swoon* They're slightly more chunky, which adds to the shine and glitz. You'll love them! While they do have more glitz and glittery particles inside, Blingz have many of the same attributes of Shimmerz that we love: They're pre-mixed liquid, water-based paints. They're made in the USA. They're non-toxic. They dry rather quickly on porus paper as well as non-porus surfaces like acetate, plastic, glass, and glossy papers. And they're must-haves! I found IT!! !I am so excited to finally figure out what was causing all that sparkle! I love glitter but this is much less messy! I came to the site after searching to find out what was used on many projects I have been seeing on other blogs! GREAT PRODUCT!! I would LOVE to win some!! So Nicole J., you lucky lady, please e-mail us at shimmerzblog@cableone.net with your mailing address so we can get this fabulous prize package on its way to you! Congratulations! Oh they are such beautiful colours! Do you have any plans to stock these in the UK soon please? Simply GORGEOUS!!!! Can't wait to stock them in my LSS!! wow!! Love the new colors. Must HAVE!!!! These look fantastic! I love all things shimmery and glittery.